Spectra Stack Tape Library from Spectra Logic will meet your backup, archive and perpetual storage requirements. Designed to be easily installed, expanded and managed, the Spectra Stack is rated at a 100% duty cycle – meaning it is one of the only stackable libraries built to perform in a 24/7 environment. Spectra Stack starts as a 6U library with 1 to 6 LTO tape drives and 10 to 80 LTO tape slots. Each module of the Spectra Stack holds an additional 10 to 80 tape slots and 1 to 6 tape drives. 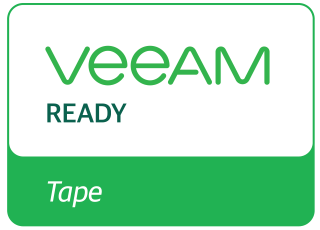 Scalable from 10 to 560 tape slots and 1 to 42 tape drives, users can store more than 6.7PB (uncompressed) of data in a fully expanded Spectra Stack library. The Spectra Stack accommodates multiple tape generations with backwards compatibility, including M7 media which expands LTO-7 tape capacity when read by an LTO-8 drive.